In Norse mythology and Marvel Comics, Thor’s hammer – the Mjölnir – is only possible to lift if you are worthy. In this video, however, the force behind wielding such a hammer is not Nordic god-like power; turns out, it's just an electromagnet stolen from a microwave. Allen Pan, from the Sufficiently Advanced YouTube channel, took to Venice Beach and challenged passersby to lift the legendary hammer. Unbeknownst to them, there's a fingerprint scanner registered to only Allen’s thumb that turns off a strong electromagnet embedded in the hammer. 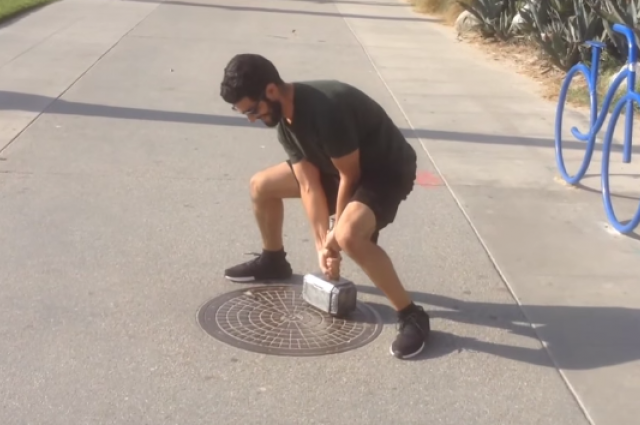 Check out the hilarious prank below, which also shows the neat electrical engineering that went into making the "unliftable" Mjölnir.